The Cal State Fullerton Titans make the trip to College Park for the first time in program history. While the Titans are known for dominating collegiate baseball, they’ve regressed this season and have struggled, and are in danger of not making the postseason for the first time in 23 years. The Titans lost four of their first five games, but bounced back with eight straight wins, featuring sweeps of Baylor and Texas Tech, until they were swept themselves by Indiana. In late March, the Titans split a midweek series with Nebraska, bringing thei record against the Big Ten to 1-4 on the season. However, despite their down year, the Titans still find themselves in second place in the Big West, trailing only UC Irvine, who they play next week. Much of the struggle for Cal St. can be attributed to the offense. As a team, they’ve hit just .259, with a strikeout to walk ratio of 282 : 147. They’re lacking power as well, as the Titans have sent only 11 balls over the fence. David Olmero-Barrera has one bright spot in the lineup. The junior from La Canada, CA, has hit .302 with four home runs, one shy of the Josh Estill’s team lead. Omlero-Barrera leads the team in RBI’s, with 27, and has hit five triples as well. The Terps scored three runs in the ninth inning to top Liberty 6-4 in a midweek matchup. Last weekend, the Terps came out on the short end of a 2-1 loss to Big Ten Conference leading Iowa to drop their second Big Ten series of the season. Brandon Lowe continues to swing the hottest bat in the conference. The second baseman has started all 35 of the Terps games and leads the team in hits (50), home runs (9), slugging percentage (.674) and walks (26). He’s also tied for the team lead in batting average with LaMonte Wade (.370), who returned last weekend from a hand injury. Eight starts. Eight wins. Hard to say much more about Mike Shawaryn. The right-hander cruised to his eighth victory of the season against Iowa last Friday, throwing a season-high 128 pitches over eight innings, striking out nine. He continues to lead the Big Ten in both wins (8) and strikeouts (69). The Shawaryn’s 19 career wins are the most by any sophomore in the country, and, with a win tonight, Shawaryn would move into a tie the school record of career wins with John Rayne. His last time out, Eshelman took a tough loss, as the Titans fell to UC Davis 3-2. The junior tossed eight innings, yielding three runs and striking out two. Eshelman, a native of Carlsbad, CA, has lasted at least six innings in each of his nine starts this season, throwing one complete game shutout against Texas Tech on March 6. He also leads the team in strikeouts, with 61. Stiles has cemented himself as the Saturday starter for John Szefc’s squad, despite losing his last start. The sophomore gave up two runs in six innings last Saturday to the Hawkeyes, striking out four. In his last two starts, the sophomore has struck out 12 and has an ERA of 2.30. Garza was shaky in his last start, giving up five runs in five innings against UC Davis last Saturday. However, the junior got the win due to some offensive help—as the Titans went on to win 10-6. 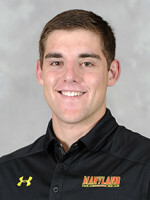 Garza, a native of Ontario, CA, is one of the shorter members of the team at 5′ 11″, and the shortest pitcher. Coaches John Szefc and Jim Belanger have yet to find a consistent third starter for the Terps. Kevin Mooney got the ball last week in his third start of the season, but was pulled after just 1.1 IP. Willie Rios, Jake Drossner, Brian Shaffer and Bobby Ruse have had chances to cement the role as well. Josh Gavin has been a freshman bright spot for the Titans. He was drafted 39th overall by the Milwaukee Brewers, but elected to attend college. Since then, he’s started nine games—winning 5, while striking out 32, good enough for third on the team. The southpaw has held opponents to just one run in two of his last three starts.